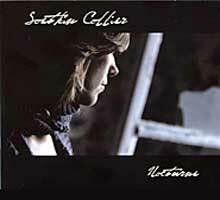 Soetkin Colliers first CD is a collection of songs about love, hope, despair and faith in a dark and romantic setting. She is accompanied by Tom Theuns on guitar and Didier François on nyckelharpa (Swedish key-fiddle). She contributes her own compositions along with personal arrangements of traditional songs from Flanders and Sweden. A recording of stark beauty and powerful moods. Any fan of Lena Willemark or Hedningarna will find this powerful and deep sound compelling. Sarah also performs with Urban Trad and Floes and was a member of Lais. Soetkin Colliers first CD "Nocturne" is a collection of songs about love, hope, despair and faith in an romantic-dreamy atmosphere. She is accompagnied by Tom Theuns on guitar and Didier François on nyckelharpa (Swedish violin). Own compositions vary with arrangments of traditional songs from Flanders and Sweden. Soetkin Collier started as a singer with Laïs and later on with Ambrozijn. In Sweden she followed vocal courses with Lena Willemark and Malin Foxdal and in Belgium with Yvonne Walter-De Kock, Hille Bemelmans and David Davidse. On the moment she takes part in a serial of workshops lead by Walpurgis, a music theater in Antwerp. She is well known as singer of Urban Trad. Guitarist Tom Theuns went to Brittany to learn DADGAD tuning and to India to learn sitar. He's the guitarplayer-singer and composer of Ambrozijn and plays together with Aurelie Dorzee and Stephan Pougin in "Aurelia". He also plays guitar in several theatreprojects. Didier François studied classical violin in Brussels and composition in Amsterdam and specialised himself in Swedish nyckelharpa. In 2007 he will be touring with the "Grappelli-tour" to commemorate the death of Stéphane Grappelli. He's also a composer of film music, theatre, musical and ballet.